There can't be many men who haven't dreamt of being James Bond at some time or another. I'll confess to practicing the occasional "gunbarrel" in the dressing mirror and ordering a shaken-not-stirred Martini or two from time to time but, for most of us, that's as far as we're ever likely to get to living like double-oh seven. However, to celebrate the launch of "SPECTRE" on DVD and Blu-Ray, 20th Century Fox gave a select number of journalists a once-in-a-lifetime opportunity to experience the thrill of "being Bond" - if only for a day - and I was fortunate enough to be included amongst them. 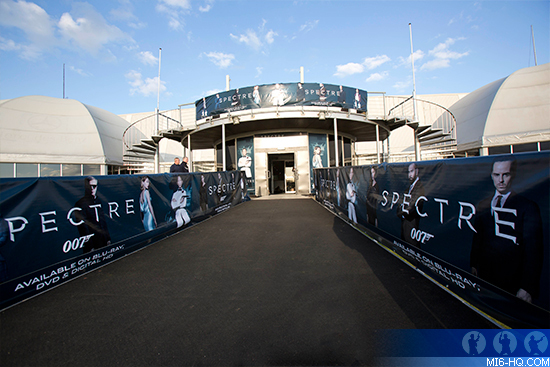 The experience began with a cocktail (a Belvedere Martini, naturally) and dinner at London's famous Rule's Restaurant - the setting for the scene in "SPECTRE" where "M" tells Moneypenny and "Q" that Bond is now on his own. Once the atmosphere of London's oldest restaurant had been thoroughly soaked up, we were driven out of London and into the heart of the Bedfordshire countryside, to the vehicle proving grounds at Millbrook, where we would be given the chance to get behind the wheel of some of the top-of-the-line vehicles from Aston Martin and receive instruction from some of the best drivers in the world. Arriving at Millbrook itself is something of a Bondian experience, with a level of security that would rival Fort Knox. This, we were told, is due to the testing of sports cars and military vehicles that are still under development. With this whiff of secrecy in the air we continued, past the gates and on to the main building. They needn't have worried about us stealing glimpses of exotic new prototypes, because once we arrived all focus shifted to the row of incredible Astons lined up outside... and the two modified DB10s sitting out in the sun on the concrete apron. 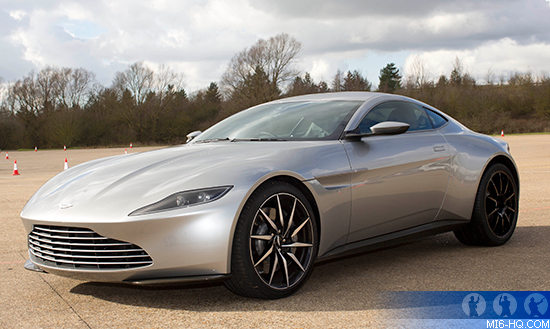 The two DB10s in question were used extensively for the vehicle chase sequence through Rome. In the first of these two vehicles, the interior had been stripped back and modified to allow for the high-speed maneuvering and stunts; no creature comforts in here, just a pure driver's cockpit. The second vehicle was slightly more unusual, being completely operated by a driver from a pod mounted to the top of the car. 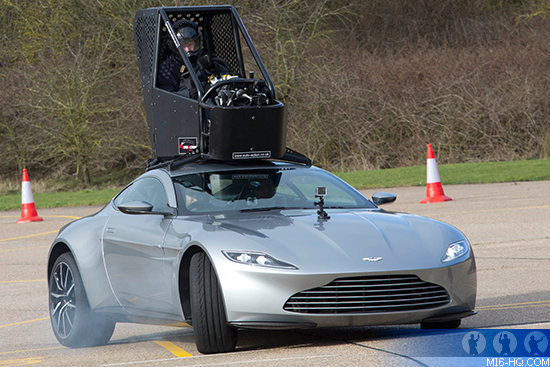 The pod modification to the vehicle was designed by Neil Layton and was used for the sequences that showed Daniel Craig's 007 driving the DB10 through the streets of Rome. This allowed for Craig to look like he was hurtling the unique supercar around sharp corners and down narrow streets, whilst actually being safely driven by stunt driver, Rob Hunt. Given that there were only ever ten DB10s ever built, to see two of these incredible vehicles together is something of a rarity. To see three is even more unusual. The third DB10 of the day greeted us as we entered the auditorium, where it sat like a shark in the shallows, surveying its prey. This beautiful, sleek machine was one of the "hero" cars for SPECTRE, which had been kept pristine for beauty shots of the vehicle. Inside, the gear lever revealed an "eject" button, and on the dashboard there were the holes where Q's control switches had been attached. These had been removed to be auctioned by Christie's for charity - the same charity auction that had seen another DB10 sell for £2.4 million just a few days beforehand. Pulling myself away from this rare and rather expensive car, I listened as members of Fox Entertainment, Aston Martin, and EON Productions introduced what was in store for us all that day. We were to be paired off with drivers who would first demonstrate the vehicle, then hand over the driving seat to us. We were promised a "Bond experience" and that was certainly no exaggeration. The first of these experiences saw me tackling the constant speed circuit in the Aston Martin V12 Vantage S. The circuit - a banked, circular ribbon of inclined concrete spanning a little over two miles - allows a vehicle to counteract gravitational force by accelerating to a specific speed. Once at speed, centripetal forces come into play and the car will simply drive itself around the circle - the perfect thing for endurance testing. After a demonstration lap from my instructor Richard, I took the car to the outer lane where I was instructed to hit 100mph. Once the speedometer hit the 100mph mark, the car seemed to become weightless, literally following the lines of the track as we raced along. As the car allowed physics to take over, there really was no need to hold the steering wheel. However, there is something rather unnerving about placing your hands on your lap as you drive a £200,000 supercar at speed around an inclined track that essentially operates as a gigantic "wall of death". 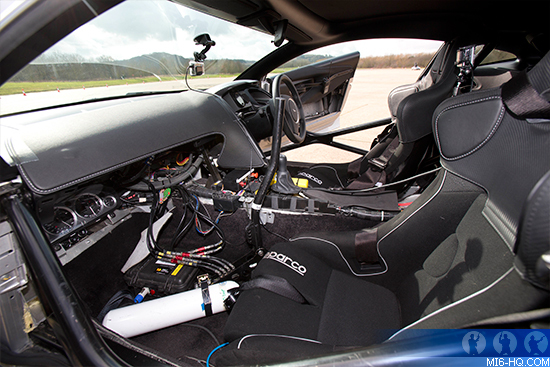 Top speed on the constant speed circuit is 130mph and the Aston Martin had no problem hitting it. In fact, as the barriers flashed by at an alarming rate, the Vantage S seemed to be frustrated that it wasn't going any faster. Even after we'd arrived safely back at the main building, the adrenaline was coursing through my veins in a way that felt like I'd been mainlining espressos all morning. Then there was the mile straight. This straight stretch of tarmac is designed for testing speed and braking - essentially an opportunity to see how fast you can take a vehicle before the road runs out and you need to brake. This seems easy enough, but taking a performance car like and Aston Martin (this time a Vantage Volante) up to high speed means that road runs out far more quickly than you might expect - and leaves you will little time to slow the vehicle down. My instructor, Ben Seyfried, drove us on our first run, taking us up to a blistering 165mph. On the second run I took over, managing a respectable 150mph, before braking (perhaps a might too gently) and setting us up for our final run. As we approached, a tour bus sat waiting on the starting line, but kindly allowed us to go first. Now, I've no idea what speed a tour bus might achieve on the straight, but it certainly would have taken them considerably longer to complete than our 20ish seconds. For this final run I hit the pedal to the floor and matched the 165mph set by the instructor. The acceleration pinned me into my seat and for those few intense seconds it felt like we were flying. My feet were still somewhat off the ground when we returned to base. My next experience was the most Bondian so far: I would take the beautiful V12 Vanquish Coupé out along the Alpine Route. As the name suggests, this track mimics the tight plunging, rising, and twisting corners of an alpine road and was the location for the record-breaking stunt in "Casino Royale", where Bond flips his Aston Martin DBS seven times. Anxious to leave that part of the experience out, my instructor took me on a lap of the route, giving clear and firm instruction as which lane to be in, when to accelerate, and, crucially, when to brake. Despite tearing around the circuit at a terrifying speed, he still had time to point out where Bond rolled his Aston Martin and where the car took air as it sped over a rise. My first lap behind the wheel was a fraught experience, with commands from my instructor, Andy, that seemed counterintuitive: Accelerating into blind corners, gripping the wheel firmly at ten-to-two and not feeding it through my hands. However, by the second lap, things seemed to go a little easier and I got a little braver, putting the pedal to the floor on the rise that saw Bond's Aston fly, and feeling that drop in my stomach as the car momentarily took air. Despite this, as we slowed to return to the main building, I couldn't help shake the feeling that I wasn't exactly racing driver material. Nerves of absolute steel are required for this job, and all I had were nerves. After the excitement of the Alpine Route, it seemed that things couldn't get much better, however, the real Bond experiences were just beginning. A ride in both the DB10 stunt vehicles awaited me, being driven by the same drivers who performed the stunts in the film. First of all was the DB10 pod car, driven by Rob Hunt from the roof-mounted pod. Climbing behind the wheel of this vehicle is a strange experience. The first thing I noticed was that there were no foot controls. The steering wheel also moved freely in my hands. In other words, I was merely along for the ride, despite the illusion of control. The pod car moves fast enough, and I was soon being thrown around the apron at speed, skidding around cones and drifting across the concrete whilst I pretended to drive. This was the very seat that Daniel Craig had occupied for the film, and only one of the eight DB10 cars provided for the filming. To be sitting behind this (admittedly fake) steering wheel was certainly the closest to Bond I was likely to get. That is until I entered the stunt DB10. Helmeted and buckled in with a three-point safety harness, it was clear that this ride was going to be serious. Everything in the vehicle was stripped back, from the roll-cage surrounding us, the to the oversized hand brake that encroached into the passenger side. Despite having watched it spin and screech across the concrete all morning, nothing, nothing could have prepared me for the ride that was to come. The skill of Mark Higgins in handling this vehicle is simply unparalleled. 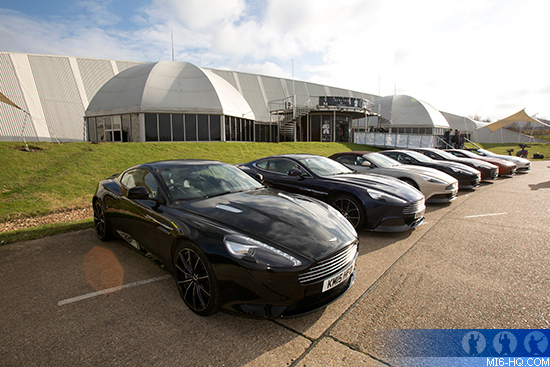 The DB10 pulled away gently from the main building and made its way sedately to the handling circuit. This was the slowest it would be getting. We reached the track and suddenly the DB10 exploded forward at an utterly ridiculous speed, heading straight toward a bend that there was no way physics would allow us to navigate. Then Mark gripped the oversize handbrake and we whipped around it in a protest of rubber and a growl from the engine that sounded like a T-Rex having an argument with a pride of lions. Over the next two laps, Mark made the DB10 seemingly defy the natural laws, before hurtling us back toward the apron of concrete outside the main building. There he threw the DB10 around in a series of skids, drifts, and doughnuts, before depositing me back, somewhat (a'hem) shaken and stirred. Finally, it was time to say goodbye to Millbrook, to the beautiful array of Aston Martins and, sadly, to the DB10. However, I can at least take comfort in the fact that whilst this experience is over, the DVD and Blu-Ray of SPECTRE is something I'll be able to enjoy again and again - especially as I can now feel a little bit closer to Bond than I ever have before. "SPECTRE" is now available to own on DVD and Blu-Ray from 20th Century Fox.